Elizabeth "Betty" Torgeson, 97, formerly Wahpeton, ND, passed away Tuesday, October 16, 2012 at Woodland Good Samaritan, Brainerd, MN. A Funeral Mass will be held on Saturday, October 19, 2013 at 11:00 A.M. at St. John's Catholic Church, Wahpeton, ND with Rev. Dale F. Lagodinski officiating. Interment will be at Calvary Cemetery, Wahpeton, at a later date. Betty chose to donate her body to the UND Medical School in Grand Forks, ND. Elizabeth "Betty" Marie Torgeson was born on December 3, 1914, at Browntown, MN, the daughter of John E. and Mary (Fogarty) O'Hearn. She moved with her family to Fairmount, ND as a young child and attended DeVillo Township #5, St. Mary's Academy, Graceville, MN, St. John's High School and graduated from Fairmount High School in 1931. She attended Valley City State Teachers College and received her elementary teaching certificate. Betty returned to DeVillo Township where she first taught. She married William T. Torgeson on December 26, 1934, in Fairmount, ND. The couple lived and raised their family in Wahpeton. Betty substitute taught for many years while raising their family. Betty and William were instrumental in forming a Senior Citizens Center in Wahpeton. They spent much of their retirement working with the Center and its funding. William died on October 18, 1988, and Betty continued to reside in Wahpeton until April of 2012 when she moved to Brainerd to be near family. She enjoyed her retirement years going to the casino with her friends and family and traveling. 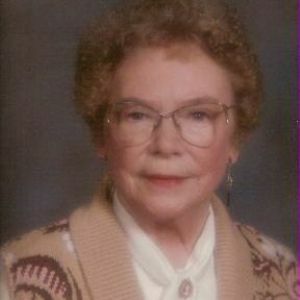 Betty was an active member of St. John's Catholic Church, the Ladies Aide, Christian Mother's, VFW Auxiliary, served as a Cub Scout and Girl Scout leader and always remained active in the Senior Citizens Center. Betty is survived by her children: Jean (Erwin) Anderson, Ottertail, MN; William (Judy) Torgeson, Lake Havasu City, AZ; Mary (Joseph) Mangini, Crosby, MN; 4 grandchildren; Kevin (Debra) Anderson, Fontana, CA, Kari (Jory Oppenheimer) Anderson, Seattle, WA, Brian Anderson, Williston, ND and Maria (Mark Sprang) Mangini, Maple Grove, MN and 4 great-grandchildren; Isaac, Jonas, Lina and Abigale. She was preceded in death by her parents, her husband, William, one infant daughter, 6 brothers and sisters; Francis Billingsley, Julia O'Hearn, Patricia O'Hearn, Eugene O'Hearn, Richard O'Hearn and Robert O'Hearn. Arrangements are entrusted with Vertin-Munson Funeral Home, Wahpeton.